To vent or not to vent, that is the question. Did you know poor shed ventilation can make you sick? Ever opened your shed door and been greeted by an aromatic noxious cloud? Poor shed ventilation isn’t healthy. Like you, I thought all the cracks and crevices I left in my shed would be enough to clear the collective smells. I was wrong. How do I get better air movement in my shed? I don’t want a system like I have in the house! So, I went looking and found 15 smart ideas to consider. I thought you’d find them helpful too. What Are the Problems Caused by Poor Ventilation in Sheds? When do You Need Ventilation in Your Shed? So How Much Ventilation Do I Need? How Different is Ventilation for Small and Large Sheds? A storage shed usually isn’t something we spend a lot of time in so we don’t think much about air quality. The door is open, there are cracks and crevices for airflow, I’m in I’m out. However, that cloud of noxious fumes that greet you at the door could easily be removed with proper ventilation. If your shed is someplace though that you tinker or do repairs, then fresh air becomes more important. The shed workshop or man cave is a place we spend more time in. The longer we’re in working on projects the more health risks we run. I can’t leave the door open when I’m working in my shed either; mosquitoes, deer flies, and chipmunks come to visit. Many of us are turning our sheds into playrooms for the kids, backyard offices for us to get away from the kids, or a shed house for the in-laws or outlaws. The longer we spend in our shed, the better air circulation we need. Also, if your shed is for human occupancy, certain building regulations that must be followed too. Poor shed ventilation can cause a variety of health risks which proper air movement can clear up. Proper ventilation will improve the airflow in your shed. It will make it more comfortable to work in and control rust, rot and mold causing humidity. It also helps improve temperature control. If you’re using your shed for storage or as a workplace, you need air circulation. Anything stored in a poorly ventilated shed will become musty smelling and moldy. Electrical tools will degrade and oxidize. If you open the door to the fumes of gasoline or other smells, you need air fresh. The amount of warm moist air out of the shed shouldn’t be greater than the amount of fresh air in. Too much intake will be exhausted. But too much exhaust can cause exhausted air to be pulled back in and may even pull snow and rain into your attic. Too much exhaust can cause the roof to be damp and cause mold and rot. The National Building Code requires 1 sq. ft. (144” sq.) of venting per 300 sq. ft. of attic/floor space with a vapor barrier, and 1 sq. ft. per 150 sq. ft. without a vapor barrier. Multiply the length by the width of your attic or floor, then divide it by 300 to determine the square footage of vents you need. Most sheds are less than 300 sq. ft., so make sure the air space in at the soffits is equal to or greater than the air space out at the ridge cap. If you don’t have openings at the soffits or a ridge cap, you need vents. An easy way to calculate the amount of venting for a shed is to take the square footage of the floor (attic if it has one) and divide it by 2, to get the square inches of venting needed. For example: a 100 sq. ft. shed divided by 2 is 50” sq. of intake and 50” sq. of exhaust. The Net Free Area (NFA) is a term used to explain the actual airflow area a vent has. If it has a screen, then the NFA only counts the open space, not the screen. For example: an 8”x 16” vent may be 128” square, but only offer a NFA of 102.4” square. Most manufacturers state the NFA for their vents. The usual method for venting a small shed is to open the door and let fresh air in. If you open the door and smell the fumes of what you store in the shed, you need fresh air. Sheds 60 sq. ft. or smaller should have passive ventilation. 60 divided by 2 is 30”sq. of vent surface in and 30”sq. of vent surface out. If you’re installing a new shed, aim one gable wall toward the prevailing wind. Install a screened vent near the roof at both gable ends, and let the wind move fresh air in and the fumes out. Sheds larger than 60 sq. ft. will need more active venting. Passive ventilation may work, but the airflow needed to ventilate a larger shed may not be practical in a passive format. If your shed is a workspace with tools or electronics, you also want to control temperature and humidity too. The main purpose of vents is to remove the heat and moisture from your attic, or roof area. It helps to prevent rot and mold and makes the shed a more comfortable place to work. There are 3 main types of ventilation; passive or natural, wind-powered, and active or mechanical powered. Each type, however, has a variety of choices available on the market. No single ventilation system works for all sheds. The system that considers your sheds roof design and removes the most attic air the most effectively, is the one best for your roof. The size of your shed also influences the options for venting. If you’re building or placing a new shed, you should select a location that is well ventilated and has some shade during the hot season. Orient your shed with the prevailing winds and passive venting at the gable roofline will help remove heat and fumes from your shed. A location with good air circulation not only reduces heat, but moisture damage and rot, and makes your shed more comfortable to work in. If you have an existing shed, you can still reduce heat naturally. Plant some shade trees to the east and west of your shed to provide shade during the hot season. If your shed has gutters, this may add some seasonal chores but will reduce heat in your shed. Vines growing on a trellis will also help reduce the heat build-up in your shed. A canvas shade tarp strung above your shed will help too. Consider changing or painting your roof to a light color, it will keep your attic cooler in the heat too. Repaint your shed with a ceramic thermal additive in the paint, it will reduce heat gain and is fire resistant. Insulating your shed will also reduce heat gain and make your shed more comfortable to work in. Installing vents in your shed will improve air quality too. Here are shed ventilation ideas. Proper air circulation will make your shed smell better, last longer, a healthier place to enter, and more comfortable to work in. I’ll discuss the pros and cons of the 15 most popular options, how they work, and their price range. The climate you live in and how you plan to use your shed will also be factors you need to consider when looking at vents. Natural ventilation relies on the movement of air by the wind, or temperature differences creating air movement as hot air rises and cool air falls. There are several natural venting options to consider when building a shed; other than the natural cracks and crevices. Soffit to the ridge is common and helps to reduce heat and moisture build-up in the attic. Drilling 2” holes in the gable ends at the roof line is another way to ventilate your shed naturally. You can also do the same thing on the walls under the eaves below the top plate if you don’t have soffits. 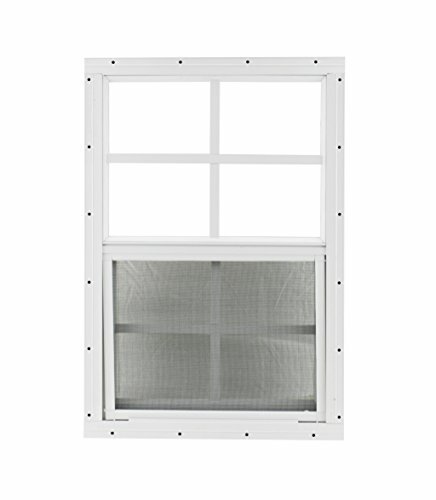 I recommend covering the natural vents with steel or aluminum window screen to keep the bugs out, and ¼” mesh screen to keep the rodents out. A louvered vent is a vent that has downward slats or louvers to keep precipitation and the sun out. They are often made of plastic or metal but can be made of wood. It is passive air flow system. The plastic and metal louvered vents usually have fins to provide rigidity and prevent bats and rodents from getting in, plus a nylon screen on the inside to keep insects out. 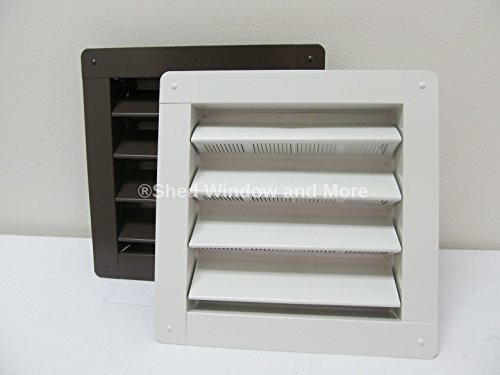 Louvered vents come in a variety of shapes and sizes and can be painted to match wall or trim color. A gable vent is a vent located just below the eaves. Follow the manufacturer’s installation instructions; it’s usually an easy job. Use the template provided, or make one out of cardboard, locate and outline where you to cut the hole for the vent. You are only cutting the sheathing, not the studs. 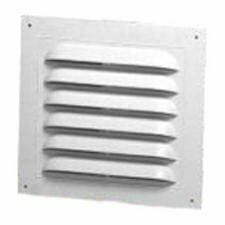 Plastic and metal vents often have a perpendicular lip that fits into the hole, and an overlapping face to hide the hole and finish the vent. They are often pre-drilled for attaching to the sheathing. Use caulking to seal around the edge to keep out moisture and insects. A gable louvered vent relies on the movement of air by the wind, or temperature differences creating air movement as hot air rises and cool air falls naturally. The heat rises to the attic area and the wind or air movement removes the heat, leaving your shed cooler. The continuous air flow helps reduce humidity and odors. You can pick the Duraflo 620808 Gable Vent up on Amazon. Wall vents are another passive ventilation option. They have louvered faces with screen backing to keep out the bugs. They come in plastic or metal and are paintable too. Just cut a hole in the siding to fit the vent and attach the outside flange with screws or adhesive, and caulk the edges. Wall vents come in a variety of sizes and shapes to fit most needs. They can be mounted low on the wall to help draw fresh air into your shed as the gable vent removes hot stale air. Use with gable or other vents higher on the wall to improve air circulation and air quality. When buying shed wall vent watch for the Net Free Area and match it with your shed size and needs. You don’t want more exhaust than intake, and vents high on the wall can act as exhaust vents. They will improve the airflow of your shed and make it more usable. Turtle vents are exhaust vents and part of a passive ventilation system. They remove heated air from the attic and help draw cooler air in to replace it from lower vents. It also pulls moisture out of your shed too. They are made of plastic or metal and come in several fixed sizes and colors but are also paintable. They are called Turtle vents because the upper cover is like a turtle’s shell. When installed near the ridge of the shed roof they look like the slats of a louvered vent. They should be evenly spaced to ventilate the whole roof effectively. If your shed has an open attic, Turtle vents will ventilate the whole shed. If you have a sealed attic with vapor barrier and insulation, you do need air from outside entering your attic at the lowest part of the roof, such as soffit vents. For these vents to work, air must come in for air to go out. As part of a sealed attic system, the Turtle vent will make it easier to control the temperature in the rest of the shed. Installing a Turtle vent is more involved than installing a wall vent. You are on the roof, so practice safe work habits. Install the vents close to the ridge of the roof and on the back of it so they are less visible. Check the spacing and location of the rafters and measure to the middle of the space between rafters. The rest of the work is done from the outside. Measure and drill a pilot hole then cut the required hole for the vent to sit into. The vent has an extensive flange around it and a hard turtle-like shell to keep precipitation, bugs and critters out. The upper flange slides under the shingles above and the rest sit on top of the shingles. Use a flat bar to lift the upper shingle and any nails. Generously coat the bottom of the flange with a waterproof adhesive sealer, and then use roofing nails to secure in place. Seal the outside edges too. 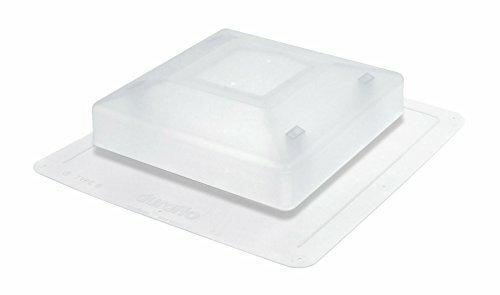 You can buy the Duraflo 6050BL Roof Vent on Amazon. Soffit vents are located at the lowest part of the roof and are intake vents. They can also be installed under the eaves to increase air intake and to exhaust warm air. The cool air is pulled in through the vented soffit and across the attic as warm air is exhausted through ridge, gable and/or Turtle vents. Metal or plastic soffit vents can be installed at the time of construction or as a retrofit. They come in a variety of sizes, shapes and several colors. Soffit vents have screened openings that allow air in, but keep the bugs out. They can be panels installed between the fascia board and wall. Other methods are 4” round vented disks or wall vents evenly spaced across the soffit, or a strip cut in the soffits length and covered with screen. We have a sleeper shed that has aluminum screen run between the fascia board and the wall. It’s the greatest Net Free Area soffit ventilation and also keeps wasps from building nests under the overhang; not the prettiest but effective. For insulated attics, it is essential to ensure the soffit vents aren’t blocked by insulation so air flows freely. The greater the opening in your soffit, the more airflow across a wider attic area, and the cooler your attic will be. 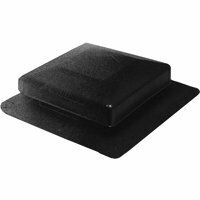 To check the price of the Duraflo 641608 Soffit Vent on Amazon click here. A ridge vent is a covered opening on the ridge of the roof and looks like part of the roof. The rafters or trusses are left exposed at the ridge and a screened metal or plastic ridge cap covers the opening. When combined with full-length soffit vents, a ridge vent is the most effective way to cool the attic and release heat and moisture from the whole roof area of the attic. 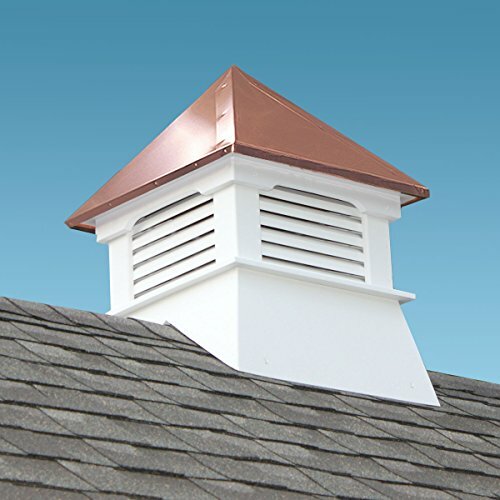 A ridge shed vent can be installed on new construction or older buildings that have a peaked ridge. For existing roofs, remove the ridge shingles and cut back the sheathing about 1”-3” on either side of the peak. Check the ridge cap manufacturer’s instructions to get the most airflow. The vent should run the entire length of the house to maximize outflow and effectively remove heat and moisture. An 8’x12’ shed has an attic area of 96 sq. ft. It needs 96 ÷ 2 = 48 inches of intake and 48 inches of exhaust venting. A 2” cut down from the ridge on each side gives a 4” wide opening and provides 4×12=48 sq. in. of ventilation. Combined with a 2” wide strip of full-length soffit on each side of the roof, and you have a perfectly balanced venting system. The ridge-soffit combination is the least obtrusive ventilation system and works even when the wind isn’t blowing. As the warm air rises to the ridge it pulls cooler air in from the soffits. This helps to keep the inside temperature of the attic close to the outside temperature. It also minimizes the amount of air pulled from below the closed attic. The ridge-soffit system ventilates the whole attic area and is more effective than the gable-soffit vent system. The gable vents only work well when the wind is blowing, and don’t remove the warm moist air trapped at the ridge. Similarly, the Turtle vents and Cupola vent the immediate area around them and not the whole roof. There is a concern in heavy snow areas that the ridge gets covered and ice dams occur and moisture builds up on the underside of the roof. This could be a problem with most roof mount vents. One solution is to install a gable vent to work with the ridge-soffit system, ensuring that exhaust venting is never greater than intake ventilation. Note: ice dams will occur if you have heat escaping into your attic in winter and the attic exhaust vents are blocked. Otherwise, your attic should be the same temperature as the outside air, and ice dams won’t form. To check the current price of the GAF Cobra3 Ridge Vent Nail Over on Amazon, click here. A cupola is a roofed vented box sitting on the ridge or peak of a roof. It sits on a base that is fitted to the angles of the roof. The sides of the box or tower are louvered and screened to permit heat and moisture to escape and keep bugs and critters out. A cupola can also be used to provide light into attic areas. They come in a variety of sizes and finishes and often have a finial or weathervane on top. The cupola can effectively remove a large volume of heated air and moisture from an attic. Although it draws a lot of air, it does miss drawing airflow from across the whole roof and can leave pockets of warm moist air trapped against the roof deck. When combined with a ridge vent it works in combination to provide complete roof venting solution. Cupolas were used to remove moist air from barns with animals inside during the winter when ridge or gable vents weren’t as effective. The size of the cupola is based on the size of your attic or floor, the same as other ventilation. An easy way to calculate it is 1 ft. of floor to 1” of opening. An 8’x12’ shed would have an 8”x12” or 96” sq. base hole. Remember, the amount of exhaust opening should not exceed the amount of intake opening. If building your own, ensure the base is larger than the hole in the roof; it’s easier to seal the base to the roof. Matching the angle of the base to the roof angle also makes it easier to seal. The height of the base may be determined by the depth of snow at the ridge during an average winter. The box is made of 4 louvered sides with the screen on the inside. The roof can be gabled or pyramidal and covered with metal or shingles depending on preferred style. Check price and pick Accentua Teton Cupola up here. A venting skylight for a shed roof is one that has openings to allow air to flow out of the attic. They’re similar in style and install to the Turtle vent, but made of a translucent material which allows light into the attic. They aren’t for seeing through or accessing the roof. They are mounted near the ridge to maximize heat and moisture exhaust. The venting skylight works in partnership with wall or soffit vents to draw cooler into the shed and exhaust heat and moisture out. It is an easy way to brighten a shed or attic too. They differ from a fixed skylight because they have screened openings that provide good ventilation. An opening window or two in a shed can provide light to find things, add to the look of the shed, and help improve airflow. Windows can be fully framed between the studs, or flange mounted like storm windows that attach to the siding and cover a cut out in the wall. A window that is open provides fresh air into the building. It works well with wall mounted or soffits to increase the airflow into the shed and helps remove hot moist air through roof mounted exhaust vents. It is an excellent way to improve air quality during hot weather and can be controlled by how much it is open. Check the price of the Shed Windows 14 X 21 White Flush Mount on Amazon. 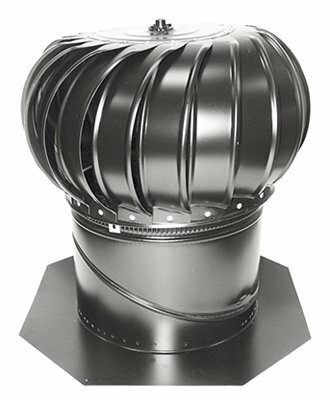 A turbine vent is a wind powered semi-mechanical vent that can draw large amounts of heat and moisture from the attic. They work best when paired with the soffit-ridge vent system as part of a balanced system. A turbine works better than the ridge vent during the winter to help prevent ice dams when deep snow can block ridge vents. It is mounted over a hole cut in the roof near the ridge and has a louvered donut or dome-shaped top mounted on a cylinder. It catches the wind and spins, creating a cyclone effect to daw out the heat and moisture. If installed properly, it shouldn’t leak at the roof, nor should precipitation be a cause for concern. If it isn’t screened, then cover the hole with the screen before placing the turbine. To determine the number and size of turbine ventilators, calculate the venting needed for the square footage of your attic and ensure the exhaust venting doesn’t exceed the intake. The turbine can draw air into the attic through other exhaust vents bringing in heat and moisture if there are not enough intake vents. A turbine as the only exhaust vent will leave hot moist air pockets trapped at the ridge too. You can pick the Lomanco BIB-12 MILL Whirlybird Turbine Ventilator up on Amazon. 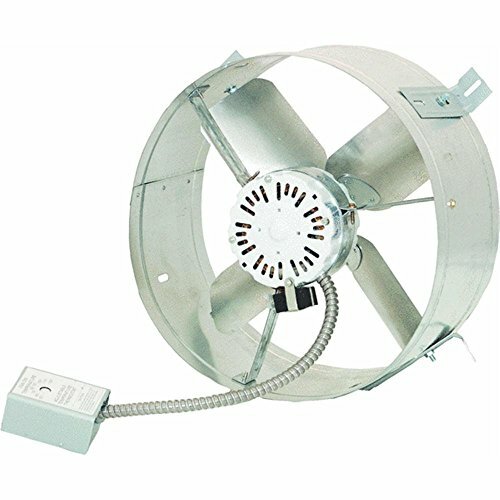 A powered wall mounted fan is a mechanical exhaust vent that requires electricity to operate. They are available in a variety of fan and motor sizes. It can be mounted in the wall of the working area of the shed to improve air quality and circulation. To install, follow the instructions and cut the appropriate size hole between the studs. The fan slides into the hole from the outside and the housing flange is secured to the wall and caulked. Depending on the product model, it can be plugged in or hardwired into the electrical system. The fan has a louvered face on the outside to prevent precipitation from getting in but may need a screen built over to keep bugs out. To work effectively, the fan should be mounted on the non-prevailing wind side of the shed to act as an exhaust vent, otherwise it’s trying to push heat and moisture against the wind. 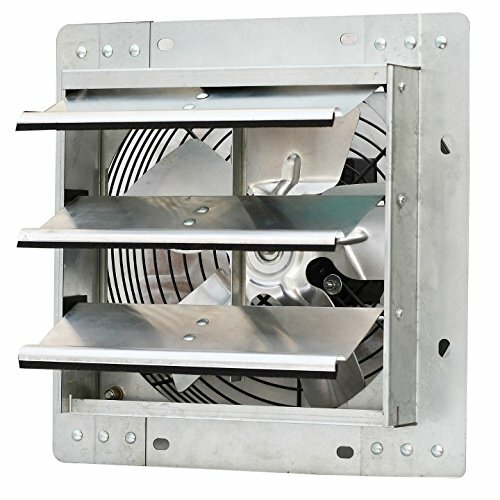 Check the price of the Iliving ILG8SF10V Wall-Mounted Variable Speed Shutter Exhaust Fan on Amazon. The powered gable vent fan mounts in the gable end to improve air circulation in the attic. It usually comes with an adjustable thermostat so it only works when needed. The powered gable fan is available in several different sizes too. It should be mounted on the non-prevailing wind side of the shed to remove moisture and heat from the attic effectively. Installation is through a properly sized hole cut into the gable end and following the manufacturer’s instructions. It is usually hard-wired in but could be wired to plug into an extension cord. The powered gable shed vents could also be mounted behind an existing passive louvered gable vent to improve air circulation. The solar attic or gable vent fan mounts in the gable end and improves air movement in the attic. It comes with a thermostat so only works when needed. It is solar powered ventilator so you don’t need to have electricity in the shed for it to work. The solar attic/gable fan is also available in different sizes. It should go on the non-prevailing wind side of the shed to so it can remove moisture and heat more easily from the attic. It can be installed through a hole cut into the gable end and following the manufacturer’s instructions, or behind a passive louvered gable vent. The solar panel can mount on a southwest facing roof, wall, or a post in the ground. The solar powered fan doesn’t require wiring like its electric counterpart, so it doesn’t add to the electric bill. It also only runs when the sun is out and heating the attic so it doesn’t need to run at night. Electric fans may have more power, but you’re also paying for that power when it’s on. Solar fans also are often made of lighter nylon parts so are usually quieter operating. The solar fan is more cost-effective at reducing heat and moisture in the attic than its electric alternative. 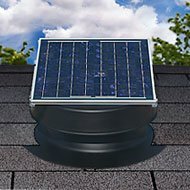 The size of solar attic fan is based on the size of the attic, its pitch and the color of your roof. Multiply the attic area by 0.7 for the minimum fan CFM (cubic feet per minute) rating. Add 20% if the roof is steep and 15% if it’s a dark color. 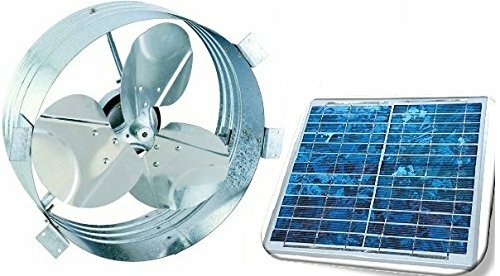 Most solar attic fans will move 800-1600 CFM. Do your research and comparison before buying. Some solar ventilators even come with a remote. 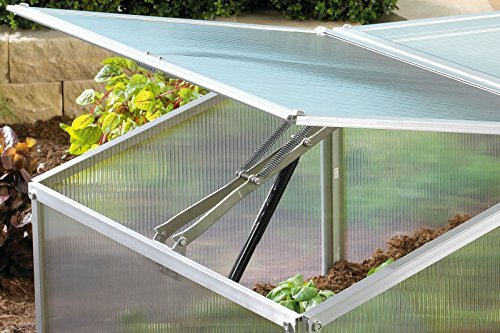 You can purchase Brightwatts Ultra Premium Industrial Grade Solar Gable Attic Fan on Amazon. The solar powered roof ventilation fan mounts near the ridge. It comes in round or square shapes and several wattages. It looks like a Turtle or a round Turtle vent with an adjustable solar panel on its back. The solar panel powers a fan inside the vent housing. The fan creates a cyclone type circulation and draws the heat and moisture out of the attic. It is designed for a sloped roof and not a flat roof or wall. The installation is simple. A correctly sized round or square hole is cut between the rafters or trusses. The hard plastic or metal housing flange slides under the shingles or roofing and covers the hole. Adhesive, sealant and nails hold it secure and make the roof-vent connection waterproof. It works well with other passive ventilation but needs to be balanced with the existing system. 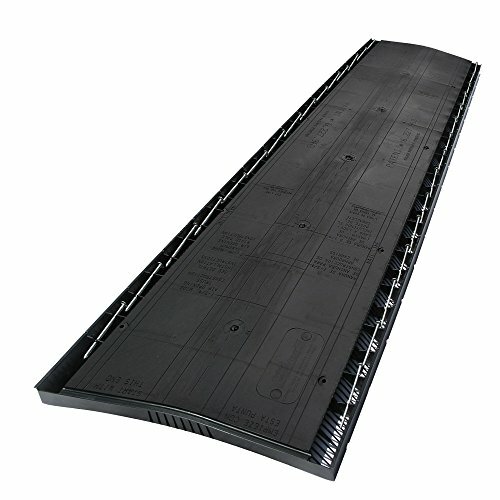 Automatic roof vent openers are neither solar nor electrically powered. This is a mechanism that is attached to a product that acts as a vent. It is operated by a heat expansive wax in a piston-cylinder attached to a hinged mechanism. The wax begins to melt and expand around 75 degrees Fahrenheit. As it expands it pushes the piston opening the hinge which is attached to the vent and opens the vent. As the wax cools, it shrinks and the piston retracts, allowing springs to close the mechanism and vent. 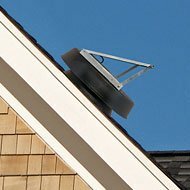 The automatic roof vent opener is usually located near the ridge-peak and operates based on the temperature within the shed. Similar mechanisms can be used to open or close a gable or wall vent. If you live in an area prone to high winds or gusts, use safety catches or chains to prevent damage to the vent and opener. A hot, cloudy day or a sunny cold winter day that creates heat build-up in the shed will still melt the wax. The melted wax opens the vent until the temperature within the shed drops, causing the wax to shrink and the springs to close the vent. It operates on the internal attic temperatures which are driven by external conditions. So, if it is cold and the shed not above the melting point of the wax, the vent stays closed. You can pick this Univent Automatic Vent Opener on Amazon. Shed ventilation turns a shed from a noxious smelling, overheated, mold growing sweatshop in the summer, to a healthier work or storage space. It helps to remove stale air, chemical smells, excessive moisture, condensation, heat and even cold. Once installed, enjoy the benefits of improved air circulation. I prefer the turbine roof vent because it moves a large volume of heat and moisture out of an attic. It’s easy to install and even works when deep snow covers other ventilation options. If it isn’t windy, it still acts a passive vent like the turtle vent. An awesome solution when combined with soffit vents. Your questions and comments are appreciated. If you know someone who has a shed in need of good ventilation, please share with them. – remove the vent cover. Make sure you use work gloves and safety goggles. If i’ve Understood correctly: 150sq’ / 2 = 75sq” = 480 cm2 needed in venting. And I would need 2 lots of this for IN and OUT. I’m thinking of putting 3 vents (6x23cm) on each side fo the cabin, left and right of the A pitch in between rafters between the roofing tongue and groove and the wall plate. Due to the design of the cabin the Gable end is not really an option.